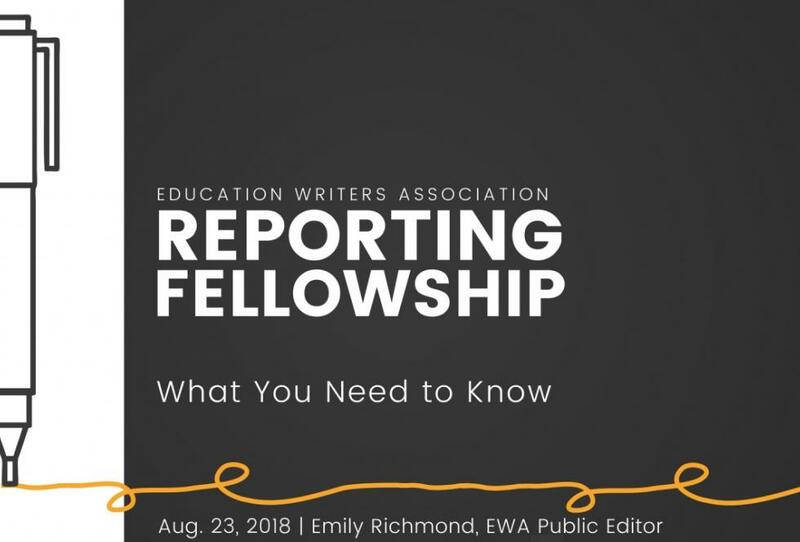 The Education Writers Association is pleased to announce a call for proposals for its seventh class of EWA Reporting Fellows. The fellowships provide financial awards to journalists to undertake ambitious reporting and writing projects that advance public understanding on critical issues. For this round, we invite applications focused on both the challenges and potential solutions to enhancing educational equity at the K-12 and higher education levels. “Through our fellowships, EWA proudly supports ambitious and enterprising news coverage and analysis,” said EWA Executive Director Caroline Hendrie. Since 2016, EWA has awarded nearly 40 fellowships to a diverse mix of journalists from all over the country. “We are thrilled that once again we can offer this unique opportunity to our member journalists,” Hendrie said. The challenges facing low-income students in accessing higher education, and efforts to expand their opportunities. Improving postsecondary education, with a focus on better serving disadvantaged students, as well as on under-resourced higher education institutions. Increasing access to, and the quality of, STEM learning in higher education. Improving the quality of teachers and school leaders (preparation, recruitment, development, etc.). New models of schooling to rethink education, and innovative practices to boost achievement. Developing new instructional materials and tools. EWA selects reporting fellows through a competitive application process. Each fellowship comes with up to $8,000 to use toward a reporting project, as well as other assistance. Recipients will have significant flexibility in how to use the funds, including travel for reporting, relief from regular newsroom duties, data support, attending workshops, and more. For more details on EWA’s non-residential fellowship program, see our FAQ page. The application deadline is Feb. 15, 2019. Fellowship recipients will be notified of their status in the early spring. Want an EWA Reporting Fellowship? Here’s What You Need to Know. EWA is looking for its next class of Reporting Fellows — education journalists who receive up to $8,000 apiece to undertake in-depth projects on a wide range of topics. This is your opportunity to get the inside track on crafting a winning application. Questions addressed include: What are the hallmarks of successful proposals? How can the money be used? What reporting topics are priorities this time? How have past fellows used their funds to produce innovative and compelling work? Please note: The deadline for this round of the fellowship was Feb. 15, 2019. EWA expects to award approximately 7 fellowships in this round. EWA will provide awards of up to $8,000 apiece to winning proposals. Please review the requirements below and submit your application online. You must submit all materials at the same time. The link to the application is at the bottom of this page. If you have any questions, please see our FAQ page. Applications are due by February 15, 2019.